Kevin Pilley takes us on a journey of fact and fiction, historical reality and literary myth. Our coffin was booked for one but we were late, having been caught in a bottleneck of bullock-drawn hay-carts in the Carpathian mountains. We took a right towards ‘The lands of the forest’ and, having driven on the edge of ‘many deep precipices’ up into the Bargalului mountains, we soon saw, towering above the Borgo (Tihuta) pass, the four-star Castle Dracula Hotel in Piatra Fantanale. Complete with Harker and Quincey Morris suites. In the famous novel, Morris is the rich Texan who dies helping Jonathan Harker and his wife Mina kill Dracula. He had prior knowledge of blood drinkers having shot his horse in the Pampas after vampire bats attacked it during the night. There was no welcoming fork of lightning. Although Visa cards were visibly welcome. A sign above the door read, ‘Come freely and leave some of the happiness you bring’. No discounts were offered for virgins. And mad coachmen were conspicuous by their absence. The receptionist didn’t have overlarge canines. And the visitors’ book didn’t contain any negative feedback about anaemia, sleepwalking or chronic blood loss. Transylvania does exist. Although it was not part of Romania when Bram Stoker’s famous vampire novel was first published in 1897. The book was only published in Romania in 1993, four years after the Revolution and the end of 42 years of Communist rule. Bram (Abraham) Stoker was born in Dublin. He worked as PA to the actor Henry Irving and managed London’s Lyceum Theatre. He never visited Eastern Europe. The closest he got was Switzerland. And his library. The landscapes in the book are of Zermatt where he holidayed. The castle described in the novel is thought to be based on one in Scotland – Slaine’s in Aberdeenshire. Stoker holidayed in Cruden Bay. He first discovered the castle while on tour with Macbeth. The book, originally entitled The Undead and then Count Vampyr, begins and ends in Transylvania. The rest of the action happens in London and Yorkshire. The story was originally set in Styria which was suggested to Stoker by a Hungarian scholar. The count’s physical appearance is probably a composite of that of the poet Walt Whitman, the composer Franz Lizt and the actor Henry Irving for whom Stoker worked as a secretary. Jonathan Harker, the solicitor who travels to Transylvania on a timeshare deal, derived his name from a scenery designer working at London’s Lyceum Theatre. “Transylvania is not England. Our ways are not your ways and there shall be to you many strange things,” said my official Dracula guide, Nicolae, from one end of the hotel’s coffin-shaped restaurant table. Mysterious Journeys, the official travel agency of the Transylvanian Society of Dracula, offers ‘Count’ holidays into the ‘Ineffable zone’. As well as courses in ghoulish folklore. And a ‘Journey Into Heaven And Hell’. Nicolae leaned over. “May I offer you one of my best Full Moons?” he said, pouring out a glass of Riesling wine endorsed by the count and carrying his diabolical appellation. Black Church built in medieval times in Council Square in downtown Brasov, Transylvania. Transylvania, which along with Moldavia and Wallachia makes up modern Romania, is an eight-hour drive northeast of Bucharest. It’s only an hour from the Ukraine border. ‘Dracula’ package tours take in the capital which boasts its 6,000-room Parliament, the second largest building in the world after the Pentagon. You also visit the Royal Palace and Cotroceni Palace, the former presidential residence. 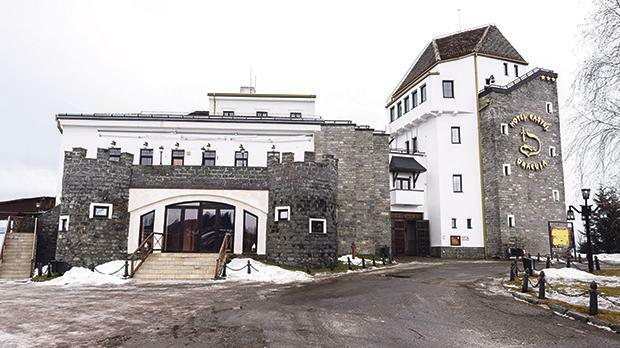 President Nicolae Ceauşescu’s former hunting lodge where he stayed during bear-hunting trips is now a hotel and en route to Transylvania. 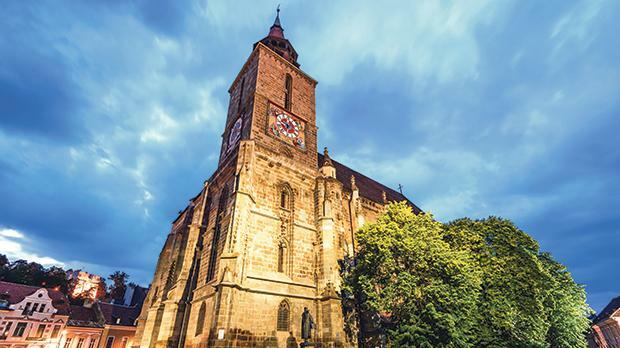 Also on the itinerary is the major tractor-manufacturing city of Brasov, also famous for its gothic Black Church, citadel and Saxon architecture. The citadel is the venue for a very corny chivalry contest, a cheesy medieval banquet and a not particularly medieval cabaret consisting of a dessert-time rendition of Sole Mio by a bad singer with an ambiguous hairline. The 14th century cliff-top Bran Castle, which has nothing to do with the myth, is on the itinerary mainly because it looks like it should. Poenari Castle was actually inhabited by Vlad Tepes, whose nickname was ‘The Impaler’, the scourge of the Turks, who is buried in Snagov. He was a 15th century lord born in 1431 in Sighisoara on the river Tarnava Mare in the region of Bios Nasaud. It is one of Europe’s finest preserved medieval walled fortress towns. There are nine towers (including the Cobblers’ Tower, Furrier’s Tower and Blacksmiths’) remaining from original 14 built by local guilds against Turkish raids. The ochre-coloured house on Str. Cositorarilor between the Clock Tower and Citadel Square was where Vlad was born (1431) and grew up in. It is now a restaurant. With a weapons museum upstairs. A wrought-iron dragon hangs above the entrance. Vlad didn’t have fangs and his connection with Dracula is notoriously nebulous. He was awarded the ‘Order of Dracul’ (dragon or devil). Dracula means son of the dragon. In Bistrita, you visit the tourist-built Golden Krone restaurant and eat as Harker did “robbers’ steak”, a goulash which is described rather appetisingly in the novel as “cooked in the simple manner of London’s catmeat”. Dubliner Stoker created an industry which has spawned over 750 films and even a medical breakthrough. Draculin is a medicine extracted from the saliva of Brazilian bats. “Can I give you a Half Moon now?” asked my guide pouring me a glass of Merlot, the count’s favourite red wine. The four-star Castle Dracula Hotel in Piatra Fantanale, Romania. The £40 per night Castle Dracula Hotel opened in 1983. 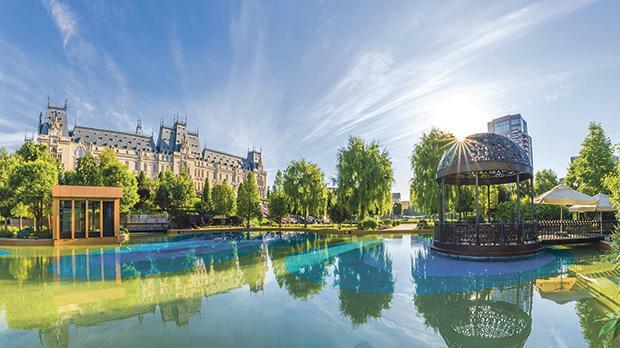 A new luxury castle is planned nearby on the banks of Lake Colibita in the Bargau Mountains. Guests will be able to sleep in coffins in an en suite dungeon. Bathrooms will have mirrors with no reflections. Crucifixes and holy water will be available around-the-clock from night porters with sickly pallors. Local carpentry skills guarantee creaky doors. “Our tours are 80 per cent superstition and 20 per cent history. The Dracula myth can be broken down into 50 separate superstitions. You must remember that the rational mind is not very old. Transylvania is a remote rural area of irrational fears and ancient folk beliefs. “As the Count advised Mr Harker, we tell our guests not to sleep unwisely and not visit any private cemeteries. We don’t do any stake stuff. In the book Dracula is actually killed by a knife. The plum brandy arrived. The waiter wore black and his eyes were dark and sunken. He was obviously overworked. Or, just undead. I asked Nicolae if the icon of all evil and monster archetype would be joining us. My erudite friend and careful driver smiled. Merlot trickled from his incisors. He shook his head, his laugh echoing through the castle. For more information, visit mysteriousjourneys@gmail.com/www.mysterious-journeys.com or e-mail rezervari@casteldracula.ro.